Northern Arizona is dominated by the Colorado Plateau, the southern border of which in Arizona is called the Mogollon Rim. In the West lies the Grand Canyon, which was cut by the flow of the Colorado River while the land slowly rose around it. In the central portion lies the Painted Desert, consisting of sedimentary rocks eroded by water and wind, exposing thick, brightly colored layers. In the East are the very large Hopi and Navajo reservations, parts of which overlap, leading to occasional territorial disputes. In this area travellers may tune their radios to hear native-language broadcasts. 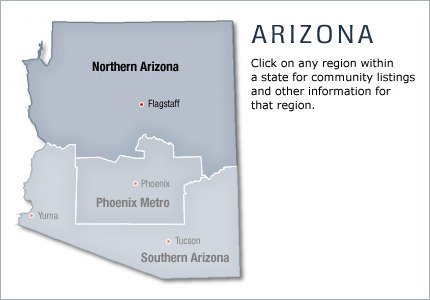 The two largest cities are Kingman and Flagstaff, which is home to Northern Arizona University and the Lowell Observatory. Much of the territory is parkland, reservations, or other federally-administered lands. Major attractions in addition to the Grand Canyon include the cliff dwellings of Canyon de Chelly, and Meteor Crater.